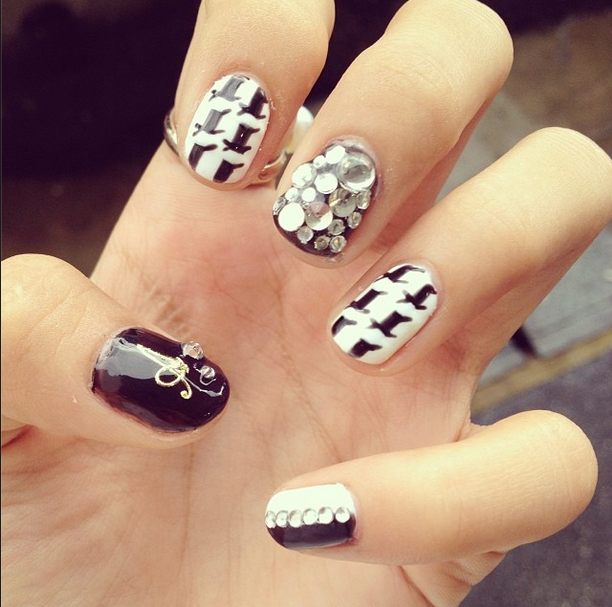 Well, I haven't gotten my nails done for really long due to filming. We aren't allowed to paint them or basically change how we look at all. That's also another reason why I haven't dyed or trim my hair at all. The reason being, some times we shoot the SAME scene on DIFFERENT days or different locations. And that time apart could even be up to weeks. And ask yourself, what if I had my nails painted in the first week and they were gone in the next week? Wouldn't that be a flaw in the movie? 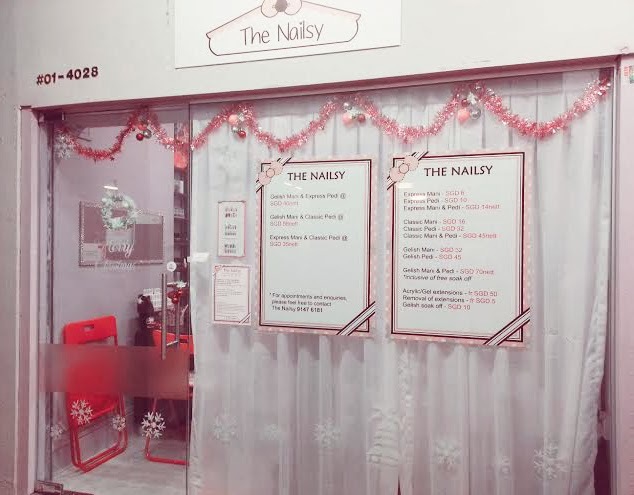 Anyway, in case you're wondering, Nailsy is a pretty young start up business owned by Sharon, my manicurist (the owner of Nailsy). I was so amazed to find out that she's SO YOUNG and already super independent. The plus point about her? She's SUPER NICE and REALLY FUNNY. We became friends immediately after my session was done. In fact, I'd put all my trust into her while deciding on what to design to go for. After all, she is the expert so I literally just sat back and relaxed while she was busy working on my nails. And the place was really comfortable too! Here's some pictures of how it looks like on the inside. It may be small but it feels really cosy. What I love so much about it is that homely feel I got while I was there. With Sharon's humility and sense of humor, I felt super at ease getting my nails done. It's a cosy little shop that looks like this! How cute is that?? Looks like a mini getaway club house. If you would like to visit Nailsy for your next manicure or pedicure, simply make an appointment with Sharon by contacting her at 9147 6181. For updates on monthly promotions, simply text her at the same number to constantly be updated! I am certain that Pinned Up Closet (PUC) is no stranger to you girls! Established in 2012, Pinned Up Closet is an online boutique based in Singapore. They offer a wide range of clothes and accessories from vintage to rock to chic. "Our team handpicks every apparel with care for it's style, comfort and quality to ensure that our customers get the best of the best!" This is such a versatile item! It is definitely one of the MUST HAVE items this season. I mean its basic but only better thanks to its pretty little pleated textures. Goes well with anything and its super comfortable too! I am so sure that this top has caught your attention cause it sure did catch mine the moment I saw it. Its one of my TOP picks from this collection. Firstly, I love how it is cropped so that it'll go well with all of my high waisted skirts and shorts. Secondly, its effortlessly chic. Once again, another piece that goes well with anything! The items that I've featured have already been launched in their latest "Adrenaline Rush" collection! So hurry up and grab what you can before they all go OOS! Input "eunice10" as a DISCOUNT CODE and receive 10% off your total bill! Only valid for the first 80 orders so wait no longer! 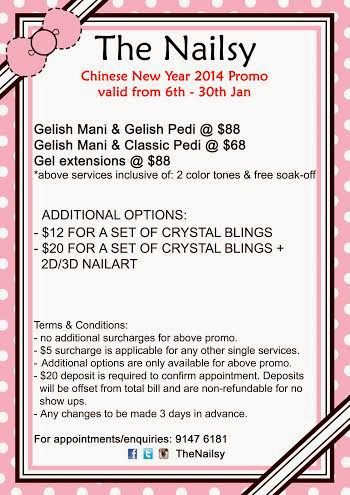 Valid till the 30th of Nov! Also don't forget to "Like" them on Facebook and follow them on Instagram! Heard that they will be doing some awesome Instagram Competitions.